When we are talking about breakfast, can we forget the Overnight Oats? I couldn't either. So keeping in view the season in my neck of the woods, I chose to showcase a pumpkin flavored overnight oats recipe. Feel free to play around with the ingredients as it suits your taste buds. You can omit the yogurt and use Almond milk or Soy milk to make it vegan. I love Greek Yogurt in Overnight oats as I find it tends to make it creamier. Also feel free to omit the chia seeds and add flax seeds if that is your preference. I have used a mason jar but any air tight container will work. Whenever I get pumpkin home, I peel, cube and freeze. It comes in handy at times like this :). The maximum time I used the night before was to cook the pumpkin and puree it which was about 7-8 minutes. Set aside all the toppings which I had on hand and in the morning assembling it was a breeze, about 2 minutes (Didn't factor in the photo shoot :)). Topping Ideas - Chocolate chips, Roasted shredded coconut, Raisins, Whipped Cream, Roasted almonds, Roasted Pumpkin seeds, Dried Cranberries etc.. The next morning, divide the oatmeal into two portions, add the toppings and enjoy. If one of the portions is unused, it can be sealed and popped back into the refrigerator and can stay there for upto 3-4 days. The toppings I used are roasted almonds, dark chocolate nibs, roasted coconut shreds, raisins and a dollop of more Greek Yogurt. I have never been a huge fan of oats, but looking at that jar, topped with nuts and the pumpkin in it, I am tempted. It looks so yum. Just prefect to kick start a day.. And this overnite oats tempts me a lot. I have never used yogurt in overnight oats and I must try it the next time. 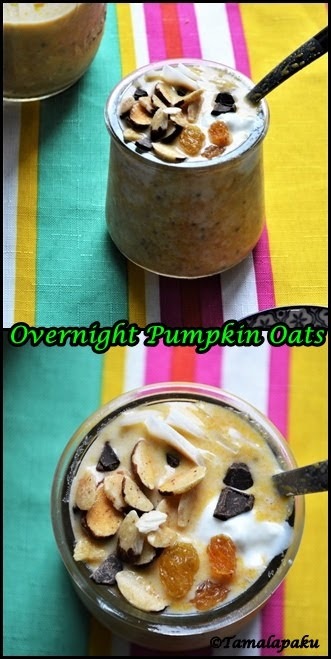 Have a pumpkin at home right now and sure to make this one.Kiddo had joined the overnight oats club and is begging me to make different flavors. This one will please her for sure! The Sun has already started to play hide and seek in our area and I am enjoying the last few sunny days left. I love the milk - yogurt combo in my overnight oats and your pumpkin version makes a great breakfast option and apt for the season. Wow Harini, your picture is calling me!. Such a great looking dish to enjoy..I have never made overnight oat till now. You are surely tempting me. Love all the ingredients and esp those choco chips..:)..wonderful theme this week..
this looks so delicious especially with all those toppings! This is my kind of breakfast Harini. Pumpkin and the spices make it perfect for the season. I need to give overnight oatmeal a try. Love this seasonal flavors with pumpkin puree and spices. Perfect way to begin the fall morning! that looks like a jar of deliciousness! the additionof pumpkin spice must oomph the flavor more!! !